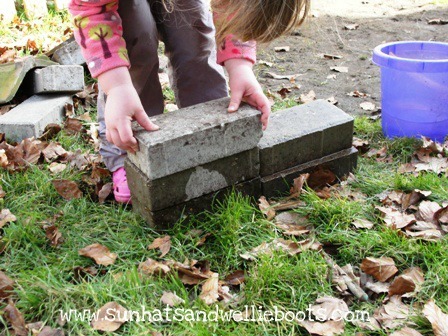 Sun Hats & Wellie Boots: The 3 Little Pigs - Reading, Playing & Building Outdoors! 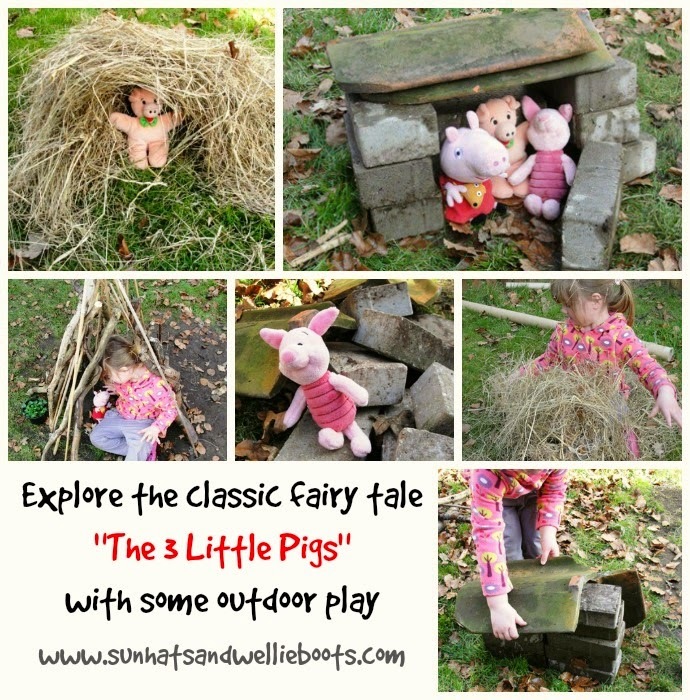 The 3 Little Pigs - Reading, Playing & Building Outdoors! 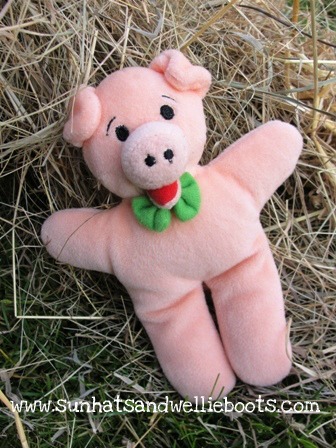 Minnie loves the classic fairy tale 'The Three little Pigs' it's one of those books she's eager to share again & again. 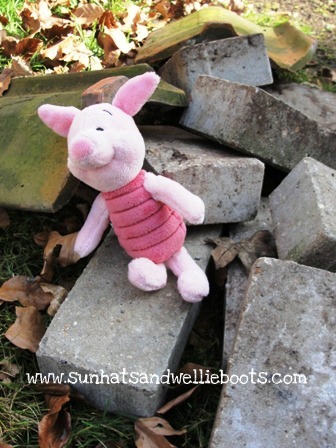 I thought she might like to explore the building materials the three pigs had, so I collected our bricks, some straw (kindly donated by a friend) & some sticks, & left them in the garden... here's how her adventure unfolded. 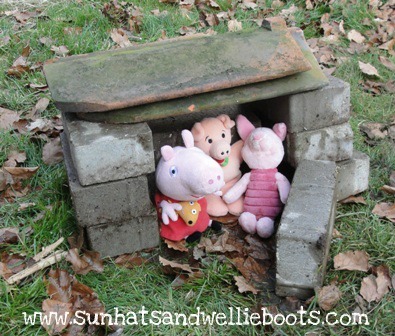 She started by collecting her three cuddly pigs & allocated building materials. Then my little builder got creating. 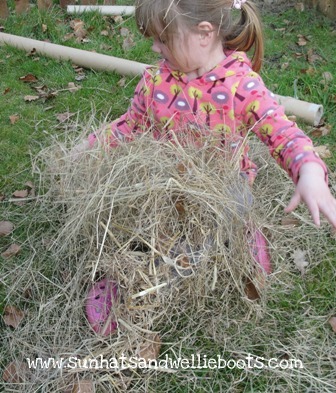 Property #1 was a fine straw construction, created in the style of an igloo! Property #2 had a little assistance with the construction (at the request of the builder) although all I really did was push the garden canes into the mud to create a basic structure. 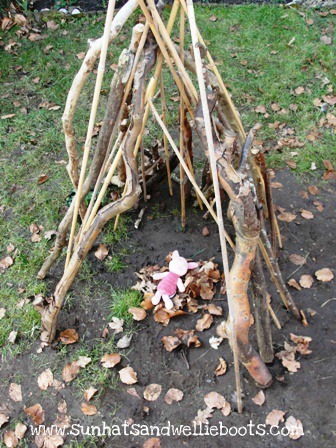 Minnie then added sticks/branches to create her wooden home. This accommodation came complete with leaf bed! Property #3 took a little longer to create. 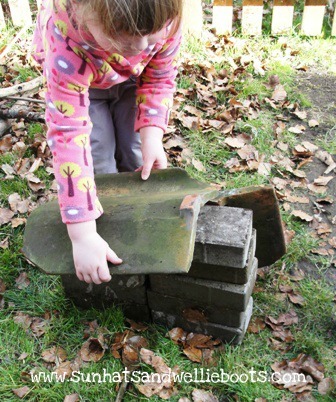 She added 'concrete' as she did before when playing with the bricks, & created a sturdy detached residence, perfect for any little pig. 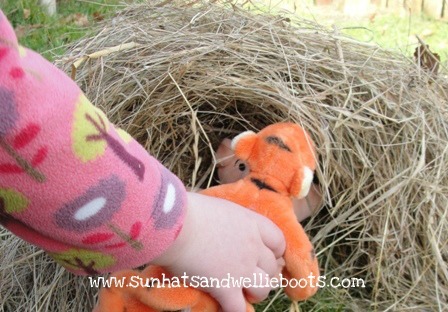 Once all the houses were ready the Big Bad Wolf appeared... in the guise of Tigger! 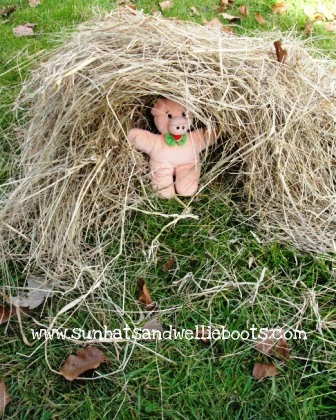 He huffed & puffed & blew knocked the house of straw down. Minnie carried the first pig over to the house made of sticks. Then the wolf was back & huffed & puffed once more. 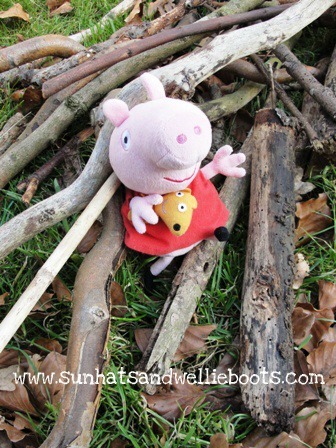 Minnie kicked the bottom of the sticks, creating a gap for her to collect the two pigs. These pigs were then carried to the house of bricks. Minnie was retelling the story as she played with the characters, & again using different voices for the wolf & pigs. "We're frightened, we're frightened" screeched the pigs in a very high voice. Once all the pigs were in the house of bricks the wolf came by again, but all his huffing & puffing couldn't move that house! 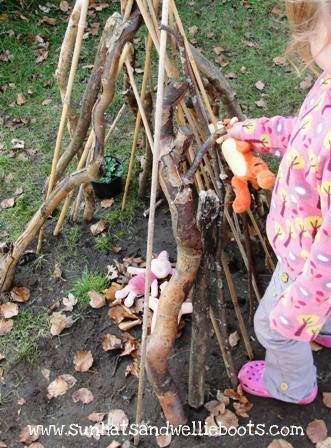 She continued exploring the story, rebuilding the houses with the pigs, & trying the houses out for herself. 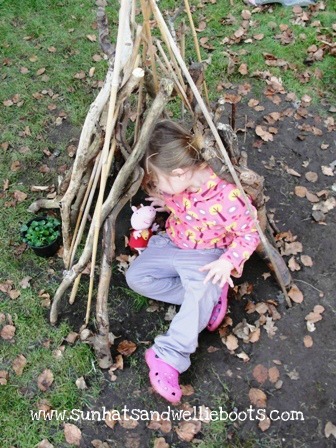 She was rather stumped with the house made of bricks so decided to just kneel in front & pretend to be inside. 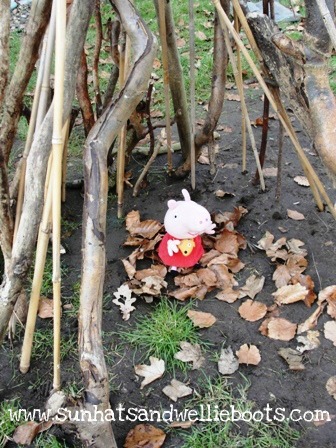 The house of sticks was definitely her favourite pad, & i think she would happily live in it if she could! There's something so special about stepping into a book & playing with the story & it's characters. It's also a wonderful way to observe children's understanding of narratives, emotions, scenarios, & language. All the posts we're sharing this week are linked to favourite stories in celebration of World Book Day on March 1st. Tuesday Tots, Learning Laboratory, It's Playtime!